The Wild Cards universe has been thrilling readers for over 25 years. 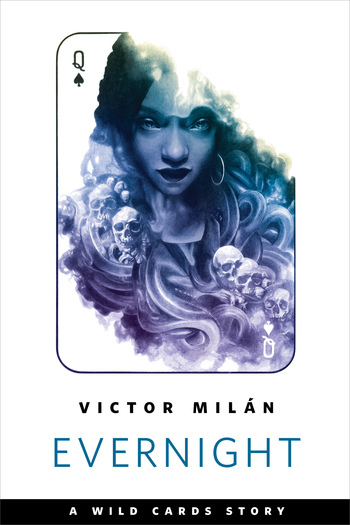 From the darkly brilliant imagination of Victor Milán, the novelette "Evernight" takes readers down to the depths of the Parisian catacombs. Candace Sessou is known to be many things: the ace known as The Darkness, a skilled negotiator in the field of diplomacy, a refugee with neither home nor family after fleeing a war-torn Congo. When she hears that her brother Marcel also survived but is now on the run as a wanted terrorist, Candace tracks him to the Parisian underground . . . only to strike a deal with dangerous forces in order to save both their lives. In previous worlds Victor Milán has been a cowboy and Albuquerque’s most popular all-night prog-rock DJ. He is the author of over 100 novels, including The Dinosaur Lords series, from Tor Books. He is also a contributing author to the Wild Cards universe.